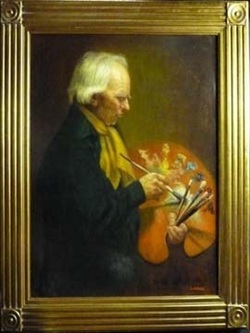 Salomon Kadoche has participated in many solo and group exhibitions throughout his distinguished career, including shows with the PSA at the Hermitage Foudation Museum in Norfolk,VA; Pastel Society of America in New York, NY; Maccoloch Hall Historical Museum in Morristown, NJ; Trenton City Museum at Ellarslie and the Baron Arts Center in Woodbridge, NJ. and the Newington Award for best painting in show from the American Artist Professional League, a national organization based in New York, dedicated to recognize visual artists. The Newington Award is very special to Mr. Kadoche, a competition that included entries from more than 30 US states, Europe, Russia and China. His subjects ranging from floral, fruit, still-lifes and marine scenes to figurative works in oil. His still- lifes are breathtakingly rendered, his landscapes explore undiscovered places, and his portraits almost talk to you. Born in Casablanca, Morocco, Salomon has dedicated his life in perfecting his highly emotional work. He earned a degree from Hunter College and studied at Art Students League and the School of Visual Arts in New York. you. He loves anything that he paints, be it an orange, a person or a landscape. He always finds a new challenge in a subject even when he paints the same thing many times. There is always a different way to look at a subject. His intention in painting is to capture the light conditions that prevail at the time. Sometimes he goes for the atmospheric qualities and other times he interprets what he sees through color.He does not have a preset formula. He always paints to solve certain problems; it could be a mood that he is looking for, exciting color, atmospheric qualities, and temperature, such as a cool or warm day. To sum up, every picture is a new experience as every day has its particularities. About still-life my work deals with atmosphere and the drama of light and dark (Chiaroscuro). The old Masters have always been his inspiration particularly the Dutch. Often he glazes several coats of transparent rich dark tones for the background and contrasts that with impastos on objects in center stage. The focal point always gets bright and thick paint, however the most important element in his work has to always be the feeling of atmosphere around the objects he paints. Moreover some mystery is conveyed by softening edges and progressively have the forms emerge gradually from the dark background up to a crescendo of light in the focal area.